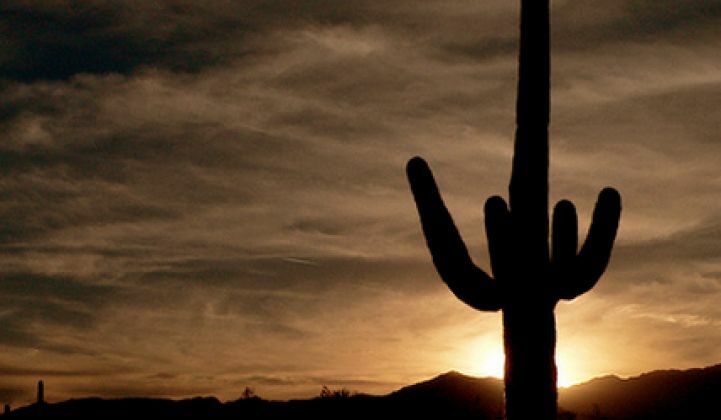 Arizona has a history of conflict between its utilities and the solar industry. But regulatory discussions have evolved since a nasty public relations battle broke out in 2013, and the state is now working through a comprehensive value-of-solar proceeding to establish a fair methodology for compensating distributed solar. It’s in this context that the Checks and Balances Project (C&BP), a clean-energy-focused watchdog group, recently accused Arizona’s Residential Utility Consumer Office (RUCO) of conspiring with Arizona Public Service (APS), the state’s largest utility. Earlier this month, C&BP published a series of text messages exchanged between Lon Huber, a consultant for Arizona’s RUCO, and Greg Bernosky, director of state regulation and compliance for APS. The messages were found among several other documents received from RUCO through a records request. The full exchange is available here, in reverse chronology. Scott Peterson, executive director of C&BP, said the text messages show that taxpayer-supported RUCO is conspiring with APS to sway a critical value-of-solar (VOS) study that will provide a basis for future residential rooftop solar pricing in the state. The VOS proceeding was approved last October, after APS withdrew its application to raise monthly fees for residential rooftop solar customers from $5 to $21 per month, claiming that opponents have turned the issue into “political theater.” The withdrawal came in late September, after an administrative law judge recommended in August that regulators defer the utility’s fee increase request to a general rate case. A few days later, Bernosky texted Huber that RUCO’s chief, David Tenney, had approved Huber's meeting with APS. “Our folks also teed up to chat on solar value models when you have a date in mind,” Bernosky wrote. APS ultimately withdrew its monthly fee proposal on September 25, 2015. According to Peterson, these exchanges are evidence that APS and RUCO are collaborating to shape the VOS proceeding before it even gets underway. He added that if there is a negative outcome for solar from the VOS study, it shows the ratepayer advocate is biased against rooftop solar and helped the utility get what it wanted. Huber said the messages are taken out of context and express positions he has already stated publicly. The message exchange took place last fall as stakeholders were debating how to set up the VOS docket and whether or not to even go through with it. Huber said his comments refer to creating a consensus on the procedural approach of the docket before it kicked off; they do not refer to aligning positions within the filing. "RUCO was asking the commission to vote on the scope of the docket and to develop a firm timeline before VOS written testimony was due,” said Huber. “The record backs up our position and my comments [regarding] the same are available for viewing on the ACC website. There was no attempt to rig the outcome." "RUCO said it clearly at the recorded Arizona Corporation Commission meeting; the commission should shape and focus the VOS [proceeding] so the scope is manageable and [able to be] completed within a reasonable time period,” he added. Huber is on the record asking for regulators to set guardrails for the VOS proceeding so that it had an established timeline and scope (video testimony at 4.44.00). He claims his text exchanges with Bernosky are referring specifically to this. Furthermore, Arizona's ratepayer advocate works closely with the solar industry and all other stakeholders in rate-related proceedings, as RUCO chief Tenney recently explained. When asked about the difference in the two groups’ filings, Peterson said he is “not a policy expert” and admitted he would have to review the filings to know what was contained in them. In addition, RUCO has asked for the VOS docket to address both self-consumed and exported solar generation, instead of just the export value. With this approach, distributed generation customers can elect to be compensated for either their entire solar production or just their exports at the credit rate set in the VOS proceeding. RUCO believes this gives customers more choice and addresses the whole solar rate design, not just half of it. These and other positions, including arguments in favor of retaining net metering, are now being considered by an administrate law judge, who will make a decision on the methodology used in the VOS case. The methodology will effectively determine the outcome. The text messages uncovered by C&BP create valid concerns about the casual manner in which stakeholders weighing the future of residential solar in Arizona communicate about the issue. It raises questions about possible biases among intervenors, but those accusations are not borne out in official filings. The exchange also draws attention to the reality that in a world of full-to-the-brim email inboxes, text messaging can be quicker and more effective way to communicate -- although perhaps not the most professional. Hearing footage shows solar advocates also receiving text messages during discussions on the VOS docket. Text messages aside, utility politics remain murky in Arizona. Earlier this month, the Arizona Corporation Commission approved hiring an outside attorney to Commissioner Robert Burns, who is being sued by APS. Last month, Burns issued subpoenas to APS and its parent company Pinnacle West seeking information on their political spending, amid suspicions the utility companies contributed $3.2 million to elect Republicans Tom Forese and Doug Little to the utility commission in 2014. In turn, APS recently filed a motion to cancel the subpoenas and charge Burns for the utility's attorney fees. The utility insists it is not required to disclose political spending information. In this environment, all stakeholder actions are likely to be subject to scrutiny.